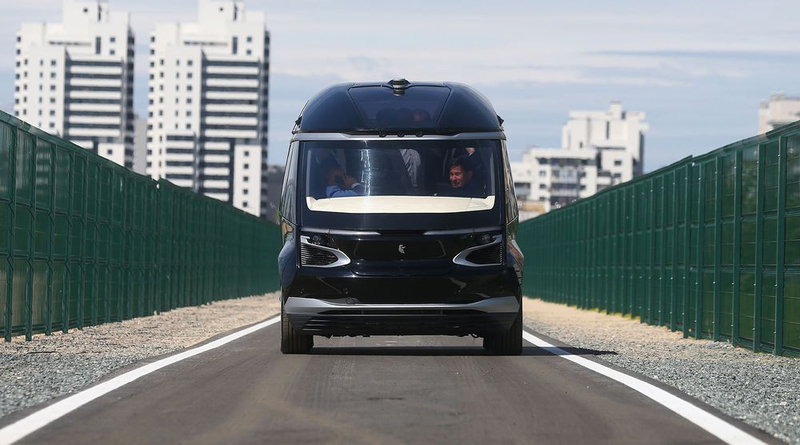 World Cup soccer spectators had the opportunity to ride driverless buses to see France’s clash with Australia in Russia’s eastern city of Kazan on June 16, part of a state-backed push into autonomous vehicles. Local truck maker Kamaz PJSC is rolling out the electric vehicles to show off its technological skills while the world’s eyes are on the remote city on the Volga River 500 miles (800 kilometers) from Moscow. It’s doing so with extreme caution, in a country where unmanned vehicles are still banned on the open road and with the government wary of any accidents that would tarnish Russia’s image. Earlier this year, a self-driving vehicle operated by Uber Technologies Inc. killed a pedestrian in Arizona and a semi-autonomous Tesla Inc. Model X crashed in California. The buses traveled just 2,132 feet (650 meters) from Kazan’s “fan zone” meeting point, along a dedicated road empty of other traffic and surrounded by a light fence to keep away pedestrians and animals. It stopped well before the Kazan Arena, leaving fans to walk the rest of the way. Kamaz wanted the buses to take the fans all the way there, but was overruled. The streets of Kazan, which will host six World Cup matches, have been smoothed in the run-up to the games. It remains to be seen how the buses would cope with the potholes and other hazards on many Russian provincial roads. Yet they are a statement of technological intent for Russia and President Vladimir Putin, who earlier this year announced that unmanned submarines were being developed with nuclear weapons to restrain U.S. military power. Putin is also supporting a push for driverless civil transportation. Kamaz, co-owned by German automaker Daimler AG and Rostec — which is led by Putin ally Sergey Chemezov — already tested a driverless truck near a new bridge to Crimea last month. The unmanned bus also showcases new-generation 5G communications technology seen as vital for driverless vehicles to function. MegaFon PJSC, Russia’s second-largest wireless carrier, is running a pilot 5G zone near the stadium and has equipped the buses with 5G modems. The modems send telemetric information about the vehicle movements and component functions to a remote operator, who can take over in case of any emergency.